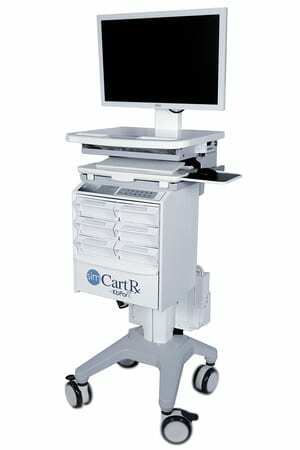 The success of a medical device is strongly linked to the successful design of its medical cart. Over the past two decades, vast advancements have been established in the design of medical carts, as well as in their ability to be customized. These advancements create a constant influx of design trends which aim to create the most ideal medical cart specific to the individual. The designing and manufacturing of custom medical carts generate multiple considerations and options – some of which could unnecessarily raise the cost and the design cycle of the medical cart. Taking a standard cart base and adding customizable options is a massive current trend. This option is a great way to test a medical carts success in its environment before developing a fully customized cart. It is also a very economical alternative to meet all the requirements of an end user. 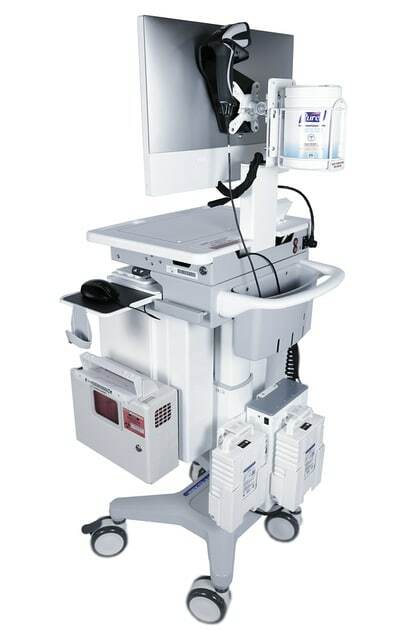 Modern medical devices have become intrinsically combined with the medical cart itself. This design trend means that medical devices are no longer sold as something that sits on the medical cart but rather the device and cart work as a system. Medical carts are no longer going unnoticed but are now on equal par with the medical device. Initially, medical carts were designed in colors that would allow the medical device to stand out and the medical cart to blend into its environment. This meant that medical carts were often neutral colors, predominately shades of grey. That is no longer the case. Bolder colors, like blacks and blues, which attract attention are now more commonly used. It has been established that it is beneficial to be 60601 compliant from the outset. Exclusively using locking casters on medical carts increases the chances that the 60601 test will be passed. It is possible for some medical carts to pass the 60601 test even though they possess a few non-locking casters. However, the current trend is to think long-term. Using locking casters from the beginning ensures no design changes will need to occur later. This precautionary trend prevents any future expenses and alterations. A decade ago, the aesthetics of casters were hardly a consideration. Dramatic steps since have been taken to improve the look of the caster unit. This has resulted in the creation of modern and visually pleasing units. There is also an emerging trend to include rolling resistance into the caster unit which would lessen repetitive strains. The constant evolving and testing of casters have made custom medical carts more visually appealing, while at the same time reducing their cross-contamination levels and enabling their cleanability. Functionally is critical to medical cart design. Designers have expanded that to include the end users’ interaction with the medical cart. Comfort for the user has become a key aspect of the design of custom medical carts. Custom medical carts need to perform, but they also need to be sensitive and empathetic to how it is interacted with by the user. Medical cart aesthetics evolve alongside the medical technology advancements. 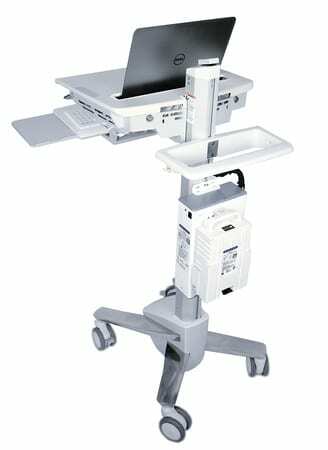 As with most technical gadgets, medical cart components have advanced to become smaller and lighter. This results in the current demand for obtaining a highly functional cart in the most aesthetic and streamlined way. The increase in elemental value and technology available for the industrial designers of medical carts has allowed for the trend of the using modernized components. Modern components use advanced technology and productively use new materials to create medical carts that are both highly aesthetic and highly functional. This trend stems from the desire of obtaining a physical prototype quickly and in achieving this the concept stage is minimized, sometimes even skipped entirely. The concept stage in development is highly important to assist in determining the exact needs of the medical cart. The capabilities, construction, and appearance of the medical cart are essential considerations. This is a highly problematic trend, and if you hope to obtain the best design available for your custom medical cart, it is recommended not to skip this crucial stage. As outlined, modern design trends center around the development of innovative and practical customized carts that best improve the user experience. Industrial designers are constantly discovering and creating ways to improve the design of medical carts, and in so doing, establishing the future trends. Design trends are fuelled by the desire to have the smallest and lightest medical cart possible, so the medical cart can easily be maneuvered by the user. Medical carts are integral to the medical industry and so will continue to evolve to provide users with the best end product possible.